While it’s arguably a bit closer to the “Arts & Crafts” region of the making spectrum upon which we don’t usually tread on account our l33t sense of superiority, we’ve got to admit that the quick and easy notebook customization demonstrated by [Sean Hodgins] is very compelling. 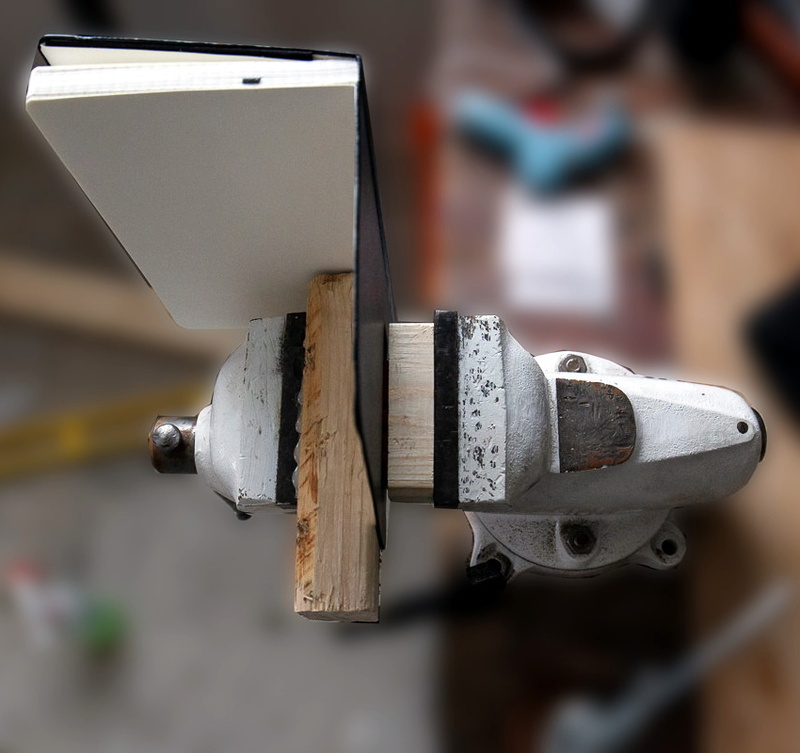 We don’t put ink to dead trees with nearly the frequency we used to, but when we do it might as well be Hemingway-style with a little black Hackaday emblazoned notebook. As demonstrated in the video after the break, the process starts by designing the stamp in your CAD package of choice. For optimal results [Sean] suggests fairly large capital letters, but with practice you should be able to get into some more creative fonts. Potentially you could even use the logo of your favorite hacking blog, but who are we to dictate what you do? Whatever you chose, it needs to be mirrored and placed on a relatively thick backing. He recommends a 2 mm thick “plate” with the letters raised on top. You’ll want to print it at a high infill percentage, but even still it shouldn’t take more than 30 minutes or so to run off. Remember there tends to be diminishing returns on infill past 50%, so taking it all the way to 100% is not going to do much but expend more time and plastic. Once printed, [Sean] hot glues the stamp to a block of wood since putting pressure on the printed piece directly would likely crack it. Then it’s just a matter of getting your notebook, printed stamp, and blocks of wood lined up in to a suitably beefy bench vise. Getting everything aligned is one of those things that easier said than done, so expect to mess up the first couple until you get the hang of it. When the alignment looks good, crank it down and let it sit for a few minutes. If you’re embossing the design into actual leather, wetting it a bit before putting the pressure on should help. The final effect is understated but undeniably very slick; and with the Holidays rapidly approaching this might be an excellent way to knock out some legitimately thoughtful gifts. Ultimately the idea here is something of a lightweight version of the 3D printed press break dies used to bend aluminum or the punch and die set used for steel plates. At this point it seems there’s enough evidence to say that 3D printed objects are certainly strong enough (in compression, at least) to put some legitimate work in. Why do people drop hundreds of dollars on designer goods? The easy answer is that, in theory, the goods are worth the expense. The materials, craftsmanship, and attention to detail are all top-notch and culminate in the finest finery money can buy. So, would you spend hundreds of dollars on a designer wallet? If you have leather crafting skills and a thrift store nearby, you could just follow [Corter Leather]’s example and make your own. He found a diamond in the rough—a genuine, well-loved Louis Vuitton bag languishing in a secondhand shop. The leather bottom and handles were dry and worn, but the signature LV canvas was still in great shape. Never crafted leather? If you can’t get free scraps for practicing, then deconstructing cheap, used stuff is the next best thing. To isolate the canvas, [Corter] carefully removed the bag’s handles, bottom, liner, and zipper and then popped the rivets and peeled the backing from the fabric. He drew up a pattern in Illustrator that pays homage to the illustrious designer’s wallets and cut the pieces out of 3oz vegetable tanned leather using card stock templates. [Corter] brought his A-game to the details. Every visible edge is painted Italian red, which he applied with an awl for a crisp line. The larger pockets have hidden stitches that keep cards from drifting to the bottom and throwing off the shape. No need to open your wallet to see how he did it—just watch the video after the break. Though it technically isn’t a real Louis Vuitton, a thief wouldn’t know it until later. Maybe [Corter] should add a pickpocket alarm. After [Travis]’s media server died a couple months ago, his brother [Nick] secretly plotted to replace it for Christmas. Admitting it to be an “asinine Rube Goldberg” arrangement, [Nick] wanted something custom and remarkable for his sibling. Rather than go the normal SATA route, 38 USB hot-swap laptop drives were clustered together inside a custom leather enclosure with a bronzed glass top. [Nick] picked up 45 of the 500GB drives for only $350 and designed the project around those. He spent $1000 on matching metal docks for each of them, powered by $800 worth of PCIe quad independent USB controllers – no hubs. A $550 Xeon motherboard with 14 USB ports, 16GB of RAM, a basic video card and a 1000W power supply rounded out the electronics. Under Windows 8.1 all drives are arranged in a single giant array under Storage Spaces, no raid. Everything was built into a wood-framed coffee table wrapped in high-end leather that [Nick] spent 65 hours hand stitching himself. Fancy brass corner braces hold the frame square. All the wires were run underneath the table so the visible surfaces are clean and clear. The table structure is lifted up on legs made from half-inch square barstock bent into a hairpin and bolted to the underside. All together [Travis]’s Zerg-Berg media server cost in the range of $4500. [Nick] intends it to be something that lasts him a very long time. See the video below for [Nick]’s rationalization explanation of the hardware and methods chosen. Yes, Kindles are wonderful, a computer full of PDFs are awesome, and [Tim Berners-Lee] will probably go down in history as more important than [Gutenberg]. That doesn’t mean there’s not something intangible about books that brings out the affections of so many bibliophiles. Even a book filled with blank pages can be a work of art unto itself, and most of the time these volumes are handmade. This video of a hardbound volume made by Smith Settle bookbinders covers the entire process from words on a page to a finished book. No, they’re not using movable type; the folios are created using lithography, but sorting, gluing, sewing and binding the folios is done in much the same way as it was done in the middle ages. Next up is a wonderful film from 1968 by Iowa state university on creating the gold tooling on fine leather-bound volumes. You’ll be hard pressed to find a book with gold tooling nowadays, but it’s still a technique accessible to the industrious amateur bookbinder. First, gold leaf is applied to the leather spine of a book. Then, custom-made tools are heated to a few hundred degrees and pressed into the leaf. The heat bonds the gold with the leather, and with custom-designed tools designs are burnt into the leather. After that, the excess leaf is simply wiped off, and a fine tooled leather book is born. What’s really cool about bookbinding is the fact that just about anyone can do it. Go to a craft store, pick up some hardboard and paper, and bind yourself a book. You could make a blank journal, or for the nerds out there (myself included), make a hard bound volume of the NASA wiring standards. This amazing steam punk keyboard was sent in to the tip line, and while it’s not necessarily a ‘hack’ in the purest sense, the level of quality in the build is incredible. Each key was crafted from brass tubing that was later filled with a wooden dowel and covered with the key cap label. While there’s no mention of how the key caps were made, we do especially like the abstract Windows Key label. After the PCB for the keyboard matrix was enclosed in a bit of plywood, the hand tooled leather was applied to the front. The name plaque that was hand engraved with a modified screwdriver is especially nice. The build is based around the amazing Das Keyboard with Cherry Blue switches, one of the only keyboards currently being manufactured that comes close to the feel of the One True Keyboard. While it’s not a keyboard built from scratch, it’s still one of the best steampunk builds we’ve seen, most likely because not a single gear was glued to the project.